The ladies in hooped skirts and cavalry officers paced nervously in the front parlor of the Graffiti House but the scene wasn't set during the Civil War. Last Saturday, three generations of David Guinns gathered for the first time in many years in the historical house that had once belonged to their family. The elder Guinn, the previous homeowner, came from Fairfax to celebrate the marriage of his son, David, the boy who discovered the Graffiti on the house's walls hidden behind years of plaster and paint. 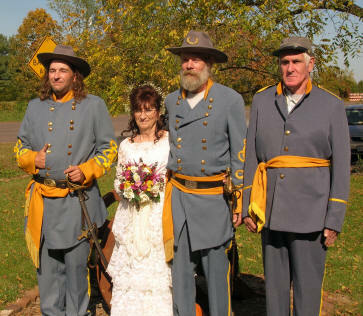 As music from a dulcimer quartet ensemble wafted through the 150 year old building, a young ring bearer dressed as a Confederate soldier lead the wedding procession. He was followed by the Matron of Honor, and the bride, Barbara Shellito, both adorned in beautiful lace dresses with billowing hoop skirts ― one in ivory and the other in pale blue. Barbara was presented to her future husband, David, by her brother. The elder David Guinn reminisced about the days when his father, another David Guinn, operated an antique store in the building together with Mr. Hitt. 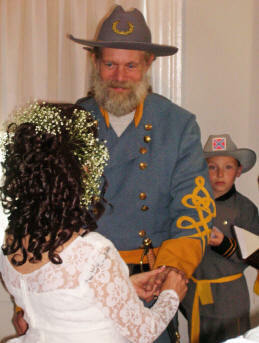 A younger David Guinn, the groom, recalled his amazement when he revealed the name of JEB Stuart on the walls of the house. He used a glass shard to remove old layers of wall paper and paint. The youngest David Guinn remembered the day his father was lowered into a dry well, looking for Civil War artifacts. The disappointed boy was not aware that the real treasure was in plain view ― the Civil War charcoal writings covering the walls of the house. 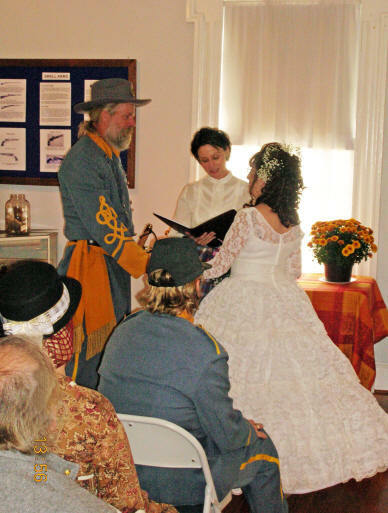 Music for the wedding was provided by four mountain dulcimers, a form of music popular during the Civil War as its sound volume was well-suited to small home gatherings in the parlor. 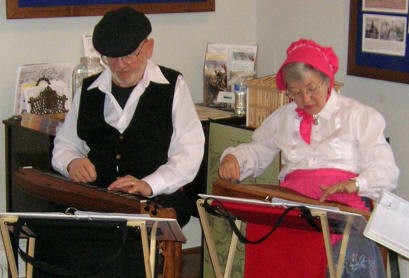 The instruments were played by a group called the Wilderness Run Players including Jan Moore, Sandy Wemmerus and two Directors of the Brandy Station Foundation, Bob and Shirley Pfile. Graffiti House volunteer, Della Edrington, stated she never thought a wedding coordinator would be among her duties at the house. Mrs. Edrington is leading the BSF effort to restore the Graffiti House.